One thing became abundantly clear as I casually collected data for this post: every York local will give you a different response. So, as a disclaimer, these are the top ten recommendations from this local. 10. Visit the York County Parks: As a city resident, the York County Parks are a favorite destination to explore other parts of the county. In addition to providing miles of trails to hike, run, walk, and bike, the 4,300 acres of parks host a growing number of other resources. For example, at John Rudy Park, you will find Canine Meadows, a dog park designed for dogs both large and small. Meanwhile, at Nixon Park, families can visit the Nature Center and learn more about local wildlife. Perhaps one of my favorite times to visit Rocky Ridge Park is in December for Christmas Magic, “A Festival of Lights”. Each year, the park hosts the event that features 600,000 lights along a trail that takes you to see a train village, holiday entertainment, and of course, Santa Claus. 9. Enjoy the Susquehanna River: While on the topic of exploring the outdoors, I cannot forget the waterway that separates York and Lancaster Counties. A quick visit to the Susquehanna Heritage Zimmerman Center will teach you about the history of the area and everything you need to know about the Captain John Smith Chesapeake National Historic Trail, the first water-based historic trail in the US. Not far down the road from the Zimmerman Center, you can visit Shank’s Mare and rent kayaks, paddleboards, and canoes. They offer activities from paddleboard yoga to history-based tours. I suggest Paddle and Pizza, which takes you on a kayak trip up the river to John Wright Restaurant for a pizza dinner on their patio overlooking the river. 8. Watch a film downtown: If relaxing while enjoying a classic or indie film is more your speed, you have two great options in the City of York to enjoy your favorite films. The Capitol Theatre shows free family movies on First Fridays and many classics throughout the year. Just down the street, you will find a more intimate venue called Small Star Art House. Small Star brings a collection of independent, foreign language, and documentary films to York and is a flagship of the WeCo neighborhood. 7. Listen to the annual steam whistle concert: Like any old town steeped in history, York is home to its fair share of unique traditions and this may be my favorite one. Every year since 1955, at 12:15 AM on December 25, Whistle Master Donald E. Ryan and members of his family play Christmas carols on an old factory whistle. The whistle was originally located at the New York Wire Company, but it was relocated to Metso Co. in recent years to preserve the tradition. Thousands of people from across the county join together to listen to the eerie concert every year. For more information, or to see videos of the concert visit their Facebook page. 6. Catch a game at the York Revolution: In twelve seasons, People’s Bank Park, home to the York Revolution baseball team, has made itself a community institution by providing entertainment for the whole family. Whether you enjoy watching a baseball game or taking part in the between-inning competitions, Revolution games are a great way to spend your day in York. 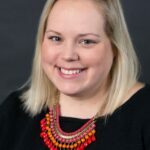 As a bonus to the York community, the organization also provides special events like the July 4th celebration, Halloween Parade, and Festivice throughout the year through its subsidiary, Eventive. 5. 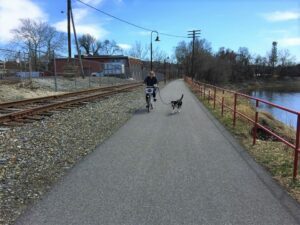 Walk or ride on the York County Heritage Rail Trail: Technically a county park, the Rail Trail deserves its own listing. The trail extends from the Mason-Dixon Line, north to the City of York. Just north of the City, the trail picks back up and stretches to John Rudy Park. The trail is outfitted with water and rest stops and is home to businesses that serve people traveling along its path. Once you are in the City of York, you are steps away from the historic Central Market and the many downtown restaurants and shops. One of the benefits of picking up the trail in the city is access to the Zagster Bike Share. Zagster allows people to rent bikes to use along the trail. Each bike can be picked up or dropped off at any of the stations throughout the city. 4. 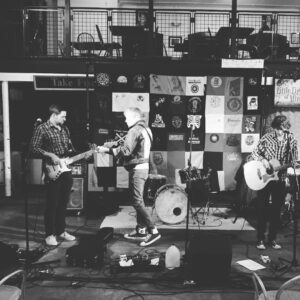 Go to a concert: Over the past decade, York has established itself in the music community as a destination for small and medium-sized touring acts. Musicians often tell us that they routed their tour through York on purpose. Others that don’t know us yet stop by, because we are an easy stop between Baltimore/DC and Philadelphia/New York. The same Capitol Theatre mentioned above also hosts CapLive, a series of concerts in the historic venue. Just next door, Kable House Presents turns the historic Central Market into a music venue that has hosted a diverse collection of bands from David Wax Museum to Strand of Oaks. 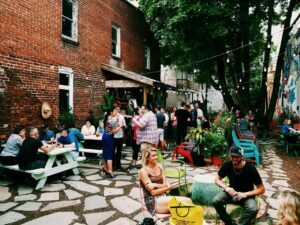 A third and equally cool venue is located just down Philadelphia Street at Sign of the Wagon. This venue is an art gallery, recording studio, private residence, and music venue. Smaller shows are hosted in a living room atmosphere where audience members and artists alike are welcomed by local artists and owners, Pete and Lindsey Richards. 3. Dine out: York is home to a diverse collection of restaurants. The range of ethnic food options — from Thai restaurants like Viet Thai Cafe and World Grills to Latino restaurants like Mi Caldero and Dona Mary’s: Tacos Y Tortas — ensures that everyone can find something they like. 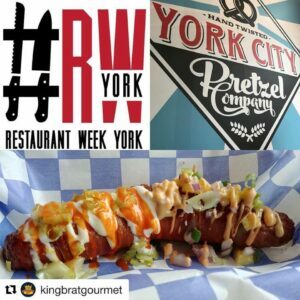 Each winter, the York City Independent Restaurant Association hosts Restaurant Week York. Restaurant Week is a great opportunity to try new restaurants or check out creative prix fixe menus of new items. The same organization hosts Burger Week, Grilled Cheese Week, and Crab Week throughout the year. There’s always something new and interesting to try! 2. Wander through Royal Square: Named for the four royal-named streets that create its footprint (Princess, Duke, King, and Queen), Royal Square District is an emerging neighborhood in the City of York that is home to many art galleries, boutique shops, and creative folks. It truly has something for everyone, but one of the most innovative places to visit in Royal Square is Taste Test, a restaurant incubator that allows aspiring restaurateurs to try out their concepts before opening a permanent location. While you’re there, walk outside to The Cantina and grab a drink or snack to enjoy in their courtyard oasis. While you are in Royal Square, I also recommend visiting Collusion Tap Works for a beer, OMG Studios or The Parliament to check out some art, Redeux Vintage Marketplace to do some shopping, and Didi and Smiling John’s Barber Shop and Salon and MKUP Beauty Studio for some TLC. York City Special Events: These include Olde York Street Fair, Yorkfest Fine Arts Festival, York Bike Night, Light Up Night, First Night York, Labor Day Festival and more. What the Food Trucks: 40 food trucks take over Penn Park in the City of York. Admission is free, pay as you eat! Check out other food and beverage events by the same group, here. First Fridays: Come downtown to visit shops, check out the restaurant scene, and participate in family-friendly activities during this monthly event. York Flea: This event happens about five times a year and features vendors that provide everything from artisan soaps and pet supplies to bike repair and custom clothing. CreekFire: Occurring on the fourth Saturday of each month in the summer, this event brings the community together for — you guessed it — a bonfire in the Codorus Creek with family-friendly entertainment in the water and on the banks of the creek in Foundry Plaza. Karin Swartz was born and raised in York County. She moved away for college and graduate school but is proud to once again call the City of York her home. Karin currently serves as the president of York Fringe (www.yorkfringe.org), an organization that is committed to providing an accessible platform for the performing arts in the City of York.